Sugarpunch is a Hybrid which is exceptional in growth strength and potency, flowers that are covered with trichomes and thc will provide a deep strong high and a solid stoned effect. Because of the strength of the sugar punch, she is very suitable to use as a medicinal strain. The THC percentage of around 25% makes this variety one of the most powerful hybrids on the market. However, above all it’s the taste and smell what makes this strain unique, strong sweet and berry dominant scent with touches of diesel (nycd) . Sometimes a feminized cross is an advantage for a breeder, such as the Sugar Punch. In this cross, the advantages of both parents come into their own very well and reinforce each other's plus points such as taste strength and this bundled in a sugar covered layer of crystals on your buds. Super silver haze is an elite clone which we have been using for a long time with excellent results, sweet taste and covered with crystals. The one is a self-selected super plant that originated from Blueberry Sativa and NYCD / C99 parents. Both parents are known for their power and taste and it was therefore not surprising that the Sugar Punch seeds also have these qualities and often on superlative levels. Since both parents are elite clones it is not possible to create this crossing any other way and that’s how we can guarantee that Sugarpunch is available exclusively in Sanniesshop. In 2006 Sannieseeds worked together for a longer period of time and shared genetics with Motarebel. Motarebel is an American breeder who, due to his medical problems, started growing plants that help him improve his condition. In 2006, Sannie got a small amount of seeds from the cross: Blueberry sativa X kila queen / NYCD also called SMM (Sannie meets Motarebel). From these seeds a selection was made until two plants remained: The One and Blueberry indica. The One is a plant that has all the characteristics of an ideal Hybrid, strong smell and taste with an enormously strong effect of both high and stoned. We came up with the idea to cross this plant with our Supersilverhaze clone which turned out to be a perfect match for The One. 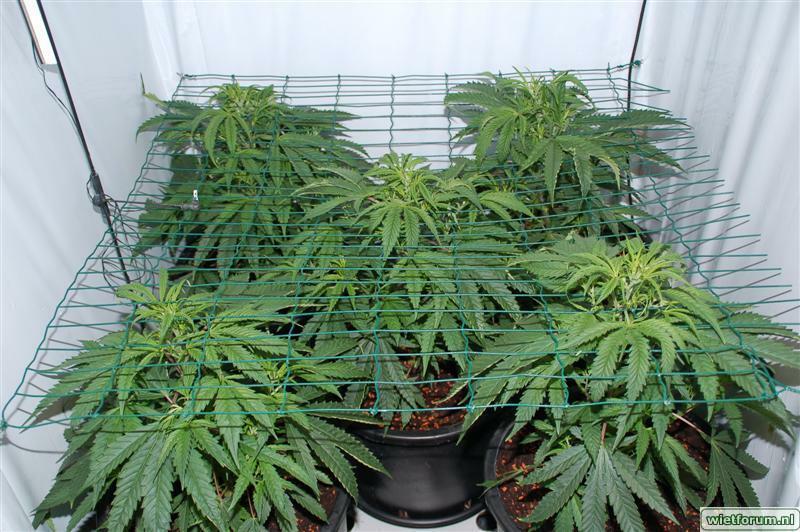 Sugarpunch is a strong growing plant with many sativa properties during the growing period, so that not many plants are needed to fill your space. After changing the light period, the Sugarpunch can grow 3-4 times its’ length, when the plant has grown at least 5 internodes (also called storeys). 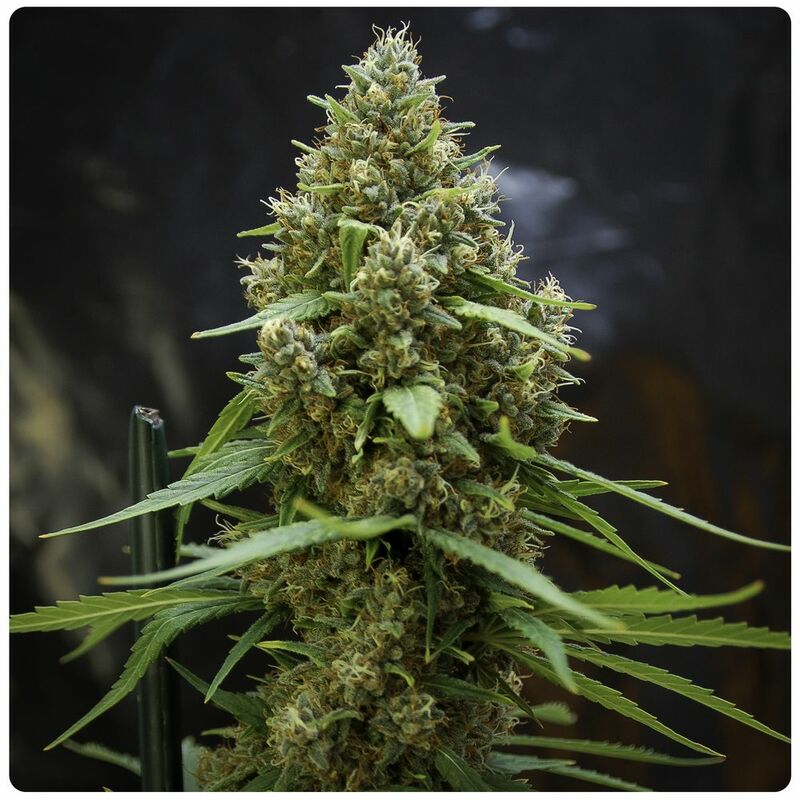 With a flowering period of around 8-9 weeks, she is a hybrid that performs a lot in the growth and flowering period. 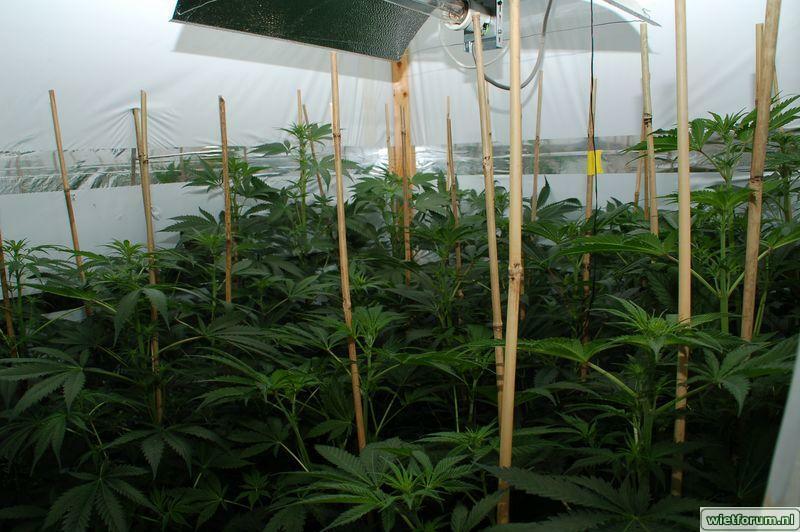 The Sugar Punch does not need a lot of plants to fill a space and when an experienced grower sets the Sugar Punch, no growth period can be a possibility, this is also called the 12/12 method. Then place about 9 plants on 1m2. For the less experienced growers it’s better to stick to the schedule below. Sugarpunch is a great yielder and ensures a very respectable weight on the scale after drying. By using the benefits of the sativa side, Sugarpunch knows how to achieve a high weight product in just 9 weeks. 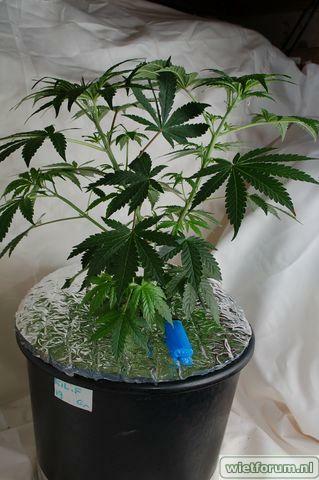 Sugarpunch strain has proven to be able to realize a gram per watt and more. For example: at 1 square meter with 600 watts and 9 Sugarpunch plants you can harvest 600 grams of finished product when the cultivation is successful. It should be mentioned that we and our customers also had higher yields, provided growing on soil with a living soil environment. In this hybrid, predominantly green plants can be found, but there are also colored plants. Sugar punch has become a phenomenon due to the smell / taste and potency and belongs to one of the best reviewed species in the world. Door het hoge THC percentage en de sterke uitwerking is Sugarpunch uitermate geschikt om als medicinale soort in te zetten, Sugarpunch zal zorg dragen voor een verminderde gevoeligheid van pijn en zorgt voor een kalmerende werking wanneer er stress aanwezig is. Door de kracht van de Sugarpunch adviseren wij met kleine hoeveelheden te beginnen en dit langzaam te verhogen om niet te sterk effect te krijgen. Deze soort is namelijk niet voor de gevoelige blowers onder ons en kan bij enkele gebruikers een te sterke reactie geven. Due to the high THC percentage and its’ strong effect, Sugarpunch is extremely suitable to use as a medicinal strain, Sugarpunch will reduce pain and provide a calming effect when stress is present. Due to the strength of the Sugarpunch, we recommend starting with small amounts and slowly increasing it until accustomed to the effect. This strain is not for the sensitive stoners among us and can give too strong a reaction to some users. Taste and smell is where our Sugarpunch excels and one should be advised that the smell of the sugarpunch requires a good carbon filter. This strong scent returns in the taste and creates a throat tingling oily feeling that only occurs with sativas and sativa dominant hybrids. So a relatively fast flowering plant with the characteristics of a longer flowering plant. This weed will blow every stoner friend away in amazement. On the podium of strains; excellent grape flavour! I found it reliably useable during the day and the creates a huge smile. So glad to see it's back! Sp is Blue Dream killer in every aspect. Order pack, find keeper in 5 seeds and forget about ordering next few years. Im keeping pack of SP in my Vault! Fantastic genetics and freebies are real deal! Probably the best polyhybrid available in seed form. There is magic in these seeds. I've found plants that finish in 40 days. That are awesome. I've found 12 weekers that are awesome too. Most fall somewhere between there - but almost every plant is good, with many great and some potentially legendary. I will always have these seeds in my vault just in case I ever lose my favorite girls. The diesel leaners are probably the strongest smoke. The one leaners flower the quickest and are also very potent. Incredible genetics! 4 plants in my 4x4 produced 10 ounces of very frosty potent bud. What was surprising was that I didn't top these girls as I customarily do with most grows. Thanks Sannie . Definitely in my all-time top 5! I have grown out 2 green phenos, both have the most over-the-top concord grape flavor and a satisfying high for both mind and body. This strain is a major achievement. Sugar Punch outside California foothills--2 plants: 7 feet and 10 feet tall. Xmas tree style with nice flowers that smell wonderful-slight lemon more orangish, pears, ripe melon and a sick-sweet. Very unusual. Harvested first week of October, due to rain. Got a little mold on some of the bigger tops---and down they came. One plant was stickier than the other but they were both stars in this year's garden. One freebe, Chemistry, is really nice too: nice fruity flavor, big solid buds. The Punch's tops were loser, hence the bit of mold from the rain, but they are turning into nice hard but pliant buds that taste and smell titzz! Thanks Sanie, you are a straight shooter in this less than straight business. Your stuff is top notch. Here in Amsterdam we love Sannie's stuff, but especially his Sugar Punch. Seriously potent, a heavy yielder and great taste/smell. An absolute winner in all regards. Thanks again Sannie! Ok...I grew this two grows back and had to take her at week 8 because of leaving town. Well, when I didn't think much of it since I harvested before it was supposed to. So one day on work break I came home and smoked some of it thinking it was gonna be mild because of the week I took it. Well, let's just say I went back to work blazed....Am I'm a smoker. Can't wait to finish her like she should be. Class A stuff man. I totally agree with the name given. What I got was an extremely frosted plant with gorgeous colorized buds. The high is a serious narcotic stone. Beautiful jewel like buds. Good yield.